Stomach, Forestomach - Fibrosis in female F344/N rat from a chronic study. The submucosa is expanded by fibrotic tissue. Stomach, Forestomach - Fibrosis in female F344/N rat from a chronic study (higher magnification of Figure 1). Fibroblasts, collagen, and scattered inflammatory cells expand the submucosa. Fibrosis ( Figure 1 and Figure 2 ) generally occurs when there is damage to the connective tissue framework that supports the parechymal elements. 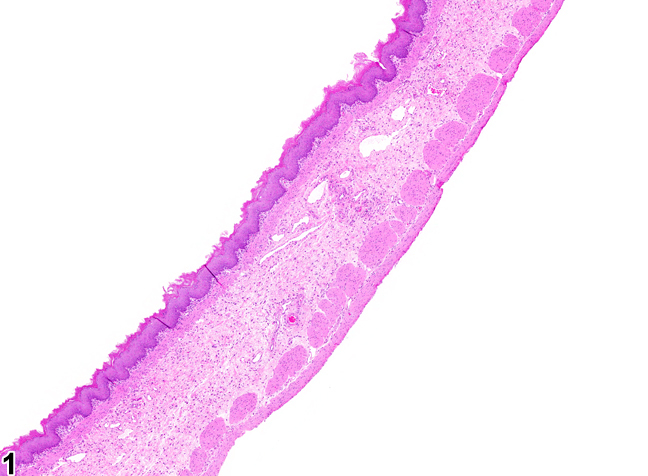 In the forestomach, ulceration of the squamous epithelium exposes the underlying submucosa to gastric contents, which can damage the connective tissue elements and result in fibrosis. Severe or chronic inflammation can also lead to fibrosis. 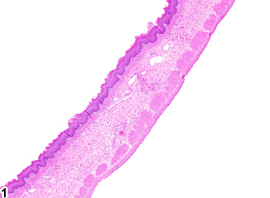 Necrotic tissue is replaced with fibrovascular tissue that contains many newly formed capillaries and fibroblasts (granulation tissue), producing an immature collagenous matrix. As fibrosis matures, it becomes less vascular and more collagenous until eventually it is fairly avascular and consists of primarily dense bundles of collagen and relatively low numbers of fibroblasts. 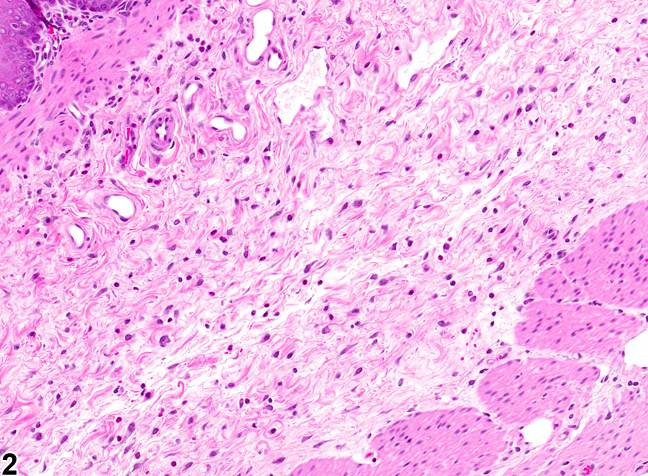 Whenever it is the sole lesion, fibrosis should be diagnosed and graded. 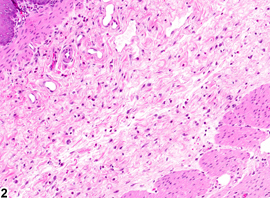 Fibrosis as a minor component of another primary process such as inflammation, ulceration, or neoplasia should generally not be diagnosed separately unless it is a prominent feature of the lesion. Kumar V, Abbas AK, Fausto N. 2005. Tissue renewal and repair: Regeneration, healing, and fibrosis. In: Robbins and Cotran Pathologic Basis of Disease, 7th ed. Elsevier Saunders. Philadelphia, PA, 87-118.